Taking the state of play on the links between climate change and fragility as a starting point, the report Insurgency, Terrorism and Organised Crime in a Warming Climate addresses the question of how the impacts of climate change are a contributing factor in the rise and growth of non-state armed groups. Four case studies that span the whole spectrum of non-state armed groups and patterns of violence, conflict and fragility explore in depth the specific role non-state armed groups play in the complex dynamics of climate change and fragility and try to identify how climate change acts as a risks multiplier in regards to non-state armed groups. The report concludes that foreign policy makers can help to address the challenges of NSAGs in a changing climate by supporting the building of more resilient states and societies. And that the key will be to more effectively link climate change adaptation, development and humanitarian aid, and peace-building and conflict prevention. The five action areas outlined in the report (see below) could serve as a starting point. Download the full text from the right-hand column. The key messages and recommendations below are based on the Executive Summary of the report. Climate change is increasingly contributing to fragility, in the analysed cases mainly by contributing to conflicts surrounding natural resources and livelihood insecurity. NSAGs proliferate and can operate more easily in these fragile and conflict-affected environments where the state has little to no authority (‘ungoverned space’) and is lacking legitimacy. Sometimes, NSAGs also try to fill the gap left by the state by providing basic services in order to gain legitimacy and secure trust and support among the local population. Climate change is having increasingly negative impacts on livelihoods in many countries and regions, e.g. through food insecurity or water/land scarcities. This makes the affected population groups more vulnerable not only to negative climate impacts but also to recruitment by NSAGs. These groups can offer alternative livelihoods and economic incentives and/or respond to political and socio-economic grievances. NSAGs are increasingly using natural resources as a weapon of war. The case studies show that in resource-scarce and fragile environments, NSAGs can use natural resources such as water as a weapon of war or inhibit access to natural resources. This, in turn, further compounds and exacerbates resource scarcities. This dynamic might be exacerbated as climate change increases the scarcity of natural resources in certain regions of the world: the scarcer resources become, the more power is given to those who control them. 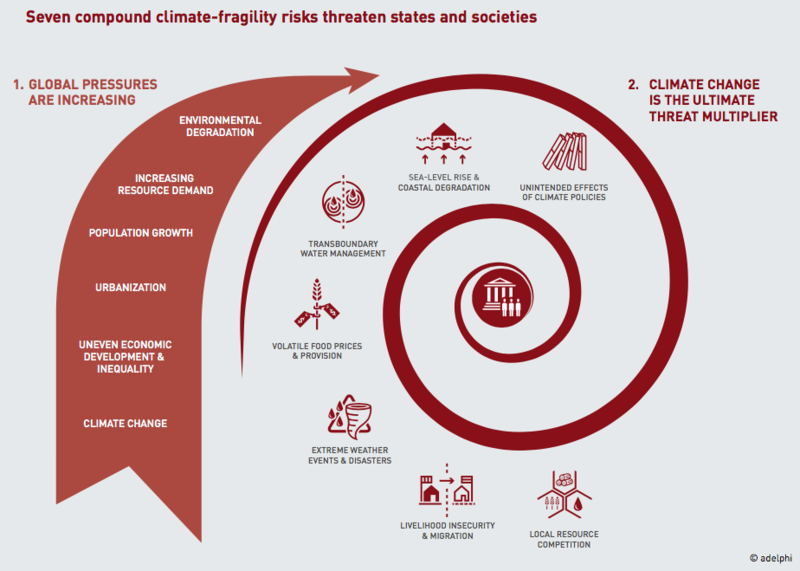 Looking at the interplay between climate change, fragility and NSAGs, there is a risk that the feedback loops and complex interactions create vicious cycles of increasing climate impacts, vulnerability, violence, conflict and fragility. As the negative impacts of climate change increase and contribute to fragility, this benefits NSAG, which leads to further destabilization and fragility, and increases vulnerability to the negative impacts of climate change. These dynamics can be further exacerbated by using increasingly scarce natural resources as a weapon. In general, climate change will increasingly challenge the ability of states to deliver services and provide stability. Extreme climate events, in particular, can strain the social fabric and the relationship between governments and populations. While government responsiveness in the face of disasters can strengthen the social contract, poor and slow responses are likely to weaken it, contributing to further instability and feeding into the downward spiral of fragility, violence and vulnerability. However, it is also important to emphasize that climate change is just one among many drivers of fragility and conflict. Climate change acts as a threat multiplier and compounds other risks. Other important drivers of fragility include ineffective responses by state security forces, a lack of traditional conflict resolution mechanisms, a lack of government legitimacy, marginalization, religion, identity, and endemic corruption. Foreign policy makers have to play an active role in breaking the vicious cycle of increasing climate impacts, vulnerability, violence, conflict and fragility and in preventing climate change contributing to an environment in which NSAGs can thrive. However, action should be based on a thorough understanding of the hybrid and complex nature of NSAGs and it needs to address the root causes of the rise and growth of NSAGs. In the political realm, there is a tendency to frame NSAGs primarily in the context of the war on terrorism. However, these actors are much more complex and diverse. States are increasingly confronted with NSAGs that blur the lines between intra- and interstate war, between traditional and non-traditional conflict settings, between ideological, political and economic interests, and between armed conflict and crime. Climate change combined with other pressures and stressors creates a specific context that is conducive to the rise and growth of NSAGs. Broadening the perspective and understanding the hybrid and complex nature of NSAGs, the motivations that drive them, and the context in which they thrive is indispensable for adequately responding to the security challenges they pose. A broader perspective will help to better address the root causes of the rise and growth of NSAGs: While economic, social and political factors remain important, the environmental dimension of fragility and conflict cannot be separated from the other three dimensions. Based on this broad understanding, foreign policy makers can help to address the challenges of NSAGs in a changing climate by supporting the building of more resilient states and societies. The key will be to more effectively link climate change adaptation, development and humanitarian aid, and peace-building and conflict prevention. The five action areas outlined in this report could serve as a starting point. Ensuring the climate and conflict-sensitivity of interventions will be key to making sure that interventions are less prone to failure, and are able to realize synergies and co-benefits. At present, like many peacebuilding activities, interventions and strategies to counter violent extremism largely do not take climate change into account. Promoting good governance and strengthening local institutions may not traditionally fall under climate change adaptation programming, but such activities are priorities in reducing the risk that climate change presents to the rise and growth of NSAGs, as well as being a core component of adaptation and peacebuilding writ large. Creating sustainable livelihoods is both important to adapting to climate change and to preventing the rise and growth of NSAGs. Peacebuilding, climate change adaptation and development impacts could be achieved by focusing on climate-sensitive sectors such as agriculture and sheries, and taking speci c account of the risks and opportunities associated with youth bulges and migration. Improving disaster risk reduction can help to break the mutually reinforcing relationship between fragility and disasters and prevent NSAGs abusing the weakness of the state. If underpinned by a plan and political willingness, disasters and crises can also be used as opportunities to increase resilience and not only rebuild better but also to increase legitimacy and even build peace. Climate change and other risks and challenges, including NSAGs, often converge in cities. Resilient cities are at the heart of resilient states and societies. It is important that the whole range of interventions including climate change adaptation, disaster risk reduction, humanitarian aid, peacebuilding and conflict prevention put a stronger focus on cities affected by fragility and conflict. Broad and integrated approaches, however, are not a goal in themselves. They are processes that need to engage people and their problems. Although there is a great potential for co-benefits and synergies, integration also often brings with it trade-offs and the need for negotiating competing interests and goals – a challenge foreign policy makers are well equipped to address. From page 18 of the report: The Lake Chad region experiences a humanitarian crisis as violence and destruction caused major population displacements. An example of the Links Between Climate Change and Non-State Armed Groups is the frequent clash between Fulani Herdsmen and Farmers in Nigeria. Lives have been lost and the Government is working on a lasting solution. The avaiable resources for the Herdsmen is getting depleted due to climate change, they are migrating Southwards where a lot of cropping activities are taking place.